Human mortality in the ancient Mediterranean world was closely linked with the rhythms of nature. Homer’s famous simile of the “generation of leaves” likening the lot of men to that of the leaves of deciduous trees, which by their regular deaths renew the life of the tree itself, provides one well-known illustration of this association (Iliad 6.146-149).This paper explores the ways that plants—trees and flowers, in particular—figured in ancient Roman funerary ritual. The use of various woods during different stages of the burial rite, the prominence of foliage during the transitional phases of the ceremony, the presence of vegetal offerings in some graves, and the devotion of specific annual holidays to floral commemoration of the dead at tomb sites point not only to a general conformity of Roman ritual to Mediterranean patterns of assimilating human and botanical mortality but also to a more precisely coded use of plants in funerary ritual that is distinctive of Roman culture. 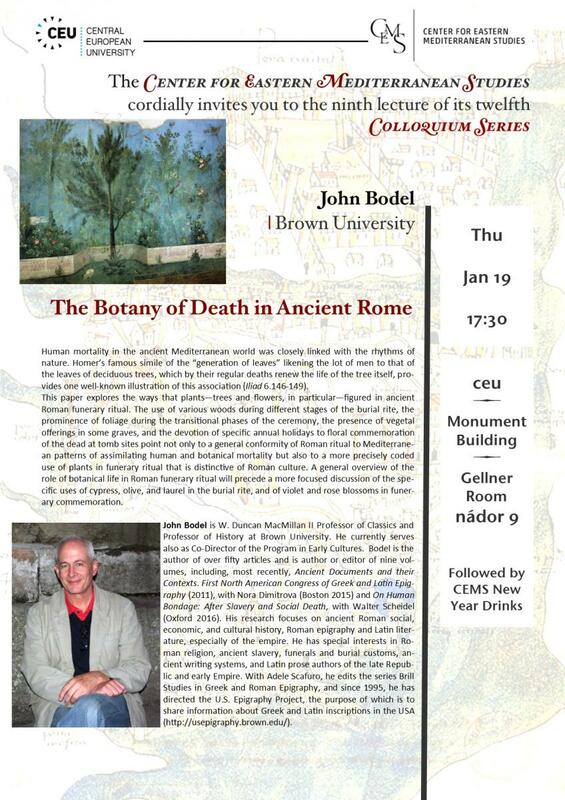 A general overview of the role of botanical life in Roman funerary ritual will precede a more focused discussion of the specific uses of cypress, olive, and laurel in the burial rite, and of violet and rose blossoms in funerary commemoration.